That beautiful custom dream home is the culmination of years of hard work. You worked and worked and here it is. Your beautiful Highland Custom Home, Utah’s custom home builders, is absolutely perfect — just about. You need that one thing — that special ingredient — to send your beautiful new home over the top. You need something that you just won’t find at the neighbors’ places. Let us help you out with a few ideas — items that will push your new home past amazing and into legend. Lawns just don’t get used as much as they should. That’s a shame — especially with the amazing weather that we have in the Salt Lake Valley. Lawn Darts are illegal, so the best way to use your lawn in the 21st century is with a beautiful Cowboy Cauldron fire pit. 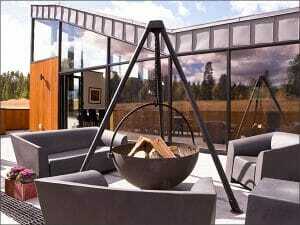 The Cowboy cauldron is a yard-party centerpiece that people will be drawn to. Not only that, you can cook all kinds of open-flame delicacies on your cauldron, and its surface is large enough to cook for the whole party. The Cowboy Cauldron is built to last for generations, and is available in three sizes — perfectly matched to fit your outdoor entertainment area. You can check them out at cowboycauldron.com. Are you a true golf enthusiast? If you have the means, you can build your dream home on a golf course so you can have your friends over to play 18 holes, weather permitting. 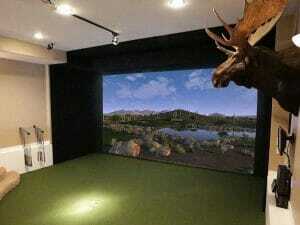 Fortunately, technology has given us an alternative — the virtual golf simulator. Now you can have the entire golf course — 80 world class golf courses, actually — in the comfort of your own home, and weather isn’t an issue. This isn’t a video game. The Vista golf simulator from Trugolf is exactly like playing the real thing, but without the sunscreen, the biting insects, and the greens fees. Even better, your Trugolf projector and screen transform your living room into a full-screen movie theater on movie night and give you ringside seats on the night of the big fight. The Trugolf Vista golf simulator sends your beautiful new home over the top with 80 of the world’s most legendary golf courses and a beautiful media center. Take a look at all of Trugolf’s golf simulators at trugolf.com. So, you have your entertainment centerpieces for your home, outside and in. What about everything else? Your home needs furniture, lighting, rugs, and décor. It would make things a whole lot easier if you had a personal designer to put it all together, as well. You can get it all at Alice Lane Home Collection — a one-stop total home outfitter and design studio. Alice Lane will supply you with all your home decorating needs. Each of the thousands of furnishings that Alice Lane carries is carefully chosen, and they cover a wide spectrum of tastes. Alice Lane’s designers also span a wide spectrum of decorating styles, so a designer will be carefully chosen to suit your particular style and needs. If you would like to see our homes in action, please stop by the Utah Valley Parade of Homes and visit Alpine Utah to see our entry. I promise you will not be disappointed. You should set your beautiful new home by a custom home builder in Salt Lake City apart from the rest of the homes in the neighborhood with finishing touches that you can enjoy every day. The only drawback? The book club will never meet at anyone else’s house.